1. Comparative-historical analysis: achievements and agendas James Mahoney and Dietrich Rueschemeyer; Part I. Accumulation of Research: 2. Comparative-historical analysis and knowledge accumulation in the study of revolutions Jack A. Goldstone; 3. What we know about the development of social policy: comparative and historical research in comparative and historical perspective Edwin Amenta; 4. Knowledge accumulation in comparative-historical research: the case of democracy and authoritarianism James Mahoney; Part II. Analytic Tools: 5. Big, slow-moving, and … invisible: macro-social processes in the study of comparative politics Paul Pierson; 6. How institutions evolve: insights from comparative-historical analysis Kathleen Thelen; 7. Uses of network tools in comparative-historical research Roger V. Gould; 8. Periodization and preferences: reflections on purposive action in comparative-historical social science Ira Katznelson; Part III: Issues of Method: 9. Can one or a few cases yield gains? Dietrich Rueschemeyer; 10. 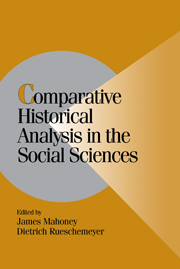 Strategies of causal assessment in comparative-historical analysis James Mahoney; 11. Aligning ontology and methodology in comparative politics; 12. Doubly engaged social science: the promise of comparative-historical analysis Theda Skocpol.